The Midnight Freemasons: There Are No Others Like It, And This One Is Mine! There Are No Others Like It, And This One Is Mine! Ever since I can remember, I have wanted to follow in my dad’s footprints. I wanted to fill his shoes, wear his Masonic ring and be part of whatever happened behind those doors to the Lodge once they closed. I never paid much attention to the Aprons that the guys wore, that is, until my father was installed as W.M. I remember my dad buying his own Past Master’s Apron shortly there after. It was one of the most beautiful, yet simple things I had ever seen. Ever since then, I have always wanted to buy my own ornate Apron. Being that I have zero pull to ascend the line of chairs, an apron with a Past Master’s jewel is out of the question. I am much to happy to support everyone in their journey from the sidelines. I guess I had my fill of being “in-charge” in my professional career. Heck, I even dropped out of the promotional process because my heart wasn’t in it. I like the responsibilities that I had, which included begin the acting lieutenant when an officer was off. Anyways, fast forward from my father’s two terms as W.M. in the early 90’s to February 11, 2013. I was summoned to my fathers side, flying from Milwaukee, WI to Sarasota, FL on the first flight I could get. He was dying and I was who he was asking for. I was the only person that could make the decisions that needed to be made. That night, sitting at my father’s side, watching him struggle to get enough oxygen was possibly the most helpless I have ever felt in my life. My father, my best friend, my Brother was fading away before my eyes. It goes without saying that Masonry was the pillar holding our lives up. Our Labor’s in Masonry, even when I was a tyke helping at the parades with the Shrine Club, drew us closer than you can imagine. I was in no way tired, but needed something to occupy my mind. So I fired up my iPad and started to listen to the newest installment of Whence Came You. Then I started messaging with Bro. Johnson asking for as many different names of podcasts and blogs to fill the hours of the night. One particular podcast stuck out as I was downloading different feeds. There was a new player on the block of Masonic Education and he just happened to be a few hours east of where I was sitting. Just a week earlier, Bro. Juan Sepulveda recorded his flagship episode of The Winding Stairs. By some celestial power, this episode was on patience. Something my father was extremely good at. As the episode began, I took off my headphones and let it lay over the speakers so that dad could hear it. After my father passed away, I found his masonic ring in his briefcase. I have worn it every day since. Then the list of things that I always wanted to do in Masonry began compiling. I had kept following Juan’s work and even ordered some of his pieces to frame and display in my office. I began traveling and attending other Lodges. The one big thing that was missing was a custom apron for me to wear. That was it, I was ordering my own Apron to have and use. And if anyone was going to make it, I wanted Juan to be the artist. I just felt a connection with his artwork, even the non-masonic pieces. I made my way through his website and picked out what I wanted and placed the order. I knew it would take some time and that was just fine with me. When Juan asked what I wanted on it, I told him that he was the artist and I trusted him to run with full artistic liberty. He was happy to oblige and appreciated the sentiments. The entire time waiting for this masterpiece to arrive was trying. But every time I thought about it, I remembered back to that night in the hospital with my father, our Brother and Juan’s words on patience. Juan had asked if it was okay to delay the shipping a bit so he could display this apron at an event he was attending. All I could think was, what an honor. This must be something special if he wants to use it to represent his work and for being understanding with the timeframe, that he would toss in a little something extra. I remember thinking that I was just excited to have it displayed, but no worries, right? And not to forget that the wait would make it that much more special, patience certainly is a noble virtue. 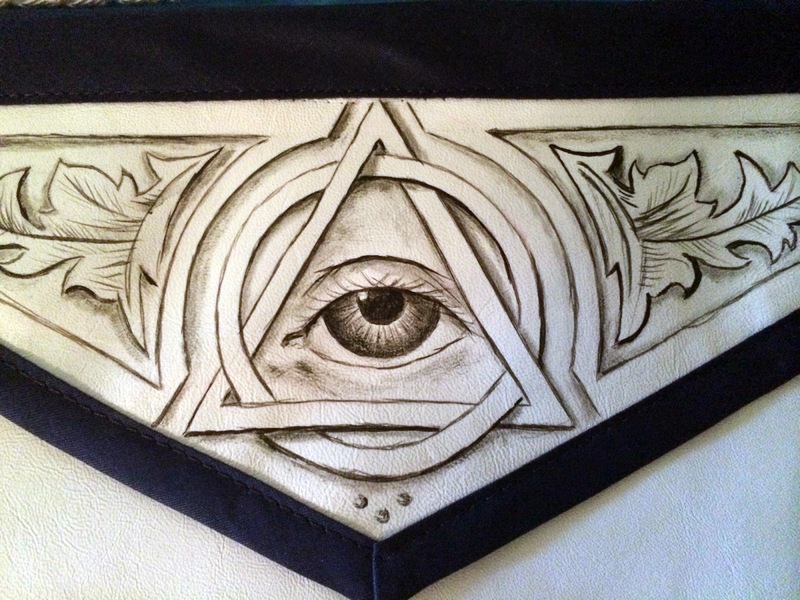 I searched around the internet for a case to protect my new piece of masonic bling. I found what I wanted and ordered it. A few days later it arrived and I thought, why not load up all my monitors and other books into the case. I also tossed my burial apron in the back to keep it safe. Then I got to thinking, I didn’t want to have the apron in the case and take the chance of it vibrating and ruining the artwork. I headed back to the internet and found a blue flannel zippered pouch that was the same size as the apron I ordered. Yes, my apron is inside of a flannel pouch, inside of a case. Overboard, perhaps. Don’t judge me. 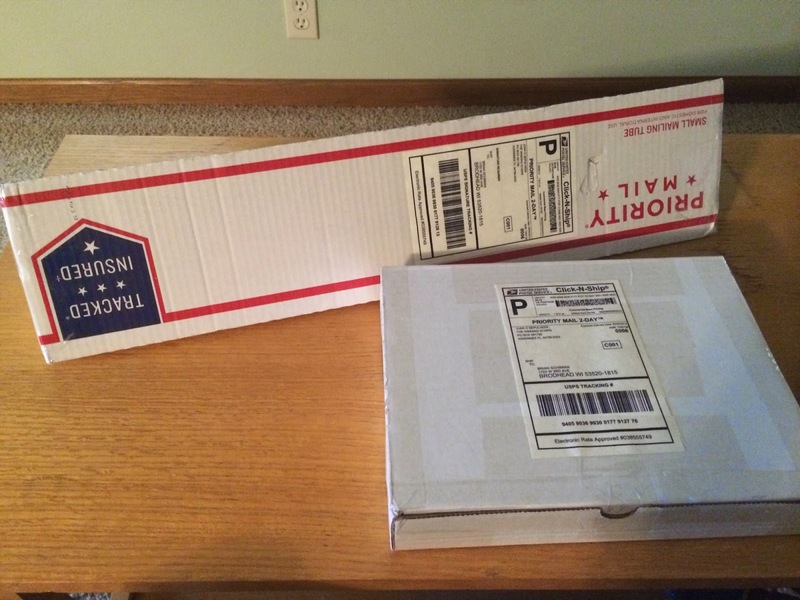 Then I got a message from Juan saying that he was packing it up and to expect two packages. I couldn’t believe it, the one piece that I have coveted for so long was going to be in my hands soon. I won’t lie, I looked up the shipping times from Florida to Wisconsin. In true federal government fashion, the chart said “2-7 Days”… Then I got to looking at shipping times around the country, it all said “2-7 Days”. Thanks for clearing that up USPS, it was clear as mud, but the clock was ticking. My apron was on the way! I had to find things to do for the next “2-7 Days” to keep from standing at my door, waiting for the mailman. When the packages finally arrived, I was so excited I could barely trust myself with a tiny pocket knife to cut the tape and get the boxes open. In true artistic fashion, my apron was wrapped in light blue paper, as is everything I have received from Juan. 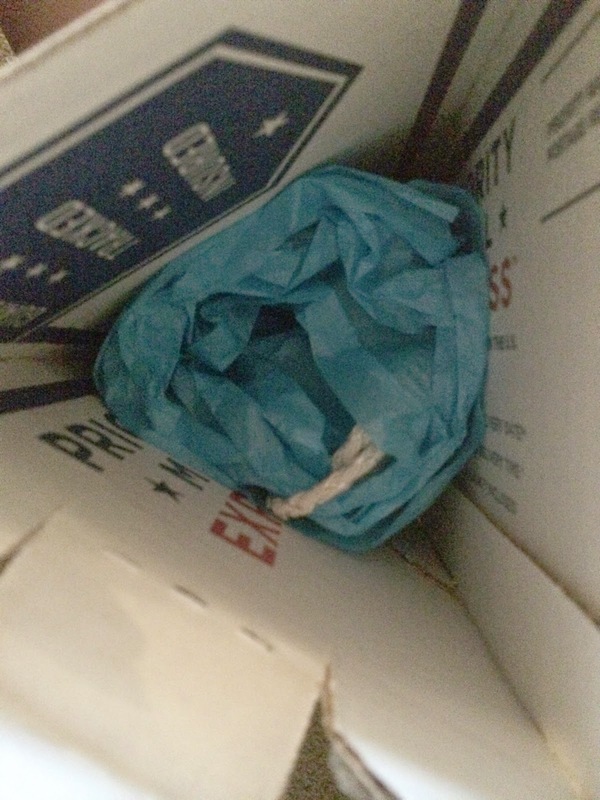 I was literally shaking as I pulled the apron out of the box and began to unroll it from the wrapping. I love the old school look of the rounded aprons and the blue trim makes it stand out, in my mind. The artwork that adorned the flap was breathtaking to say the least. I looked at the flag I have from my father’s funeral services and said, “there it is”. I was overrun with emotion, reliving that night in the hospital keeping watch, listening to Bro. Sepulveda’s take on patience. I now had a living piece of artwork that I can wear in Lodge and as I travel. Every time I look at this beautiful creation, I feel as though my father and a little of Bro. Sepulveda are with me. I can not wait for my next time inside of a Lodge so that I can wear my new apron. I am still blown away days later. I keep going and opening my apron case just to make sure it is really mine. I almost am afraid to wear it. But then I remembered that I received another package from Bro. Sepulveda. A token of appreciation for my, patience. Again, my mind began to spin, wondering what could possibly be waiting for me inside. I carefully slit the tape and unpacked the light blue paper to reveal not one, but two prints from Juan. By chance, I flipped them over and then I noticed a personal message. The contents of this message will remain between Bro. Sepulveda and myself, but it goes without saying that we share some similar experiences. I am genuinely, genuinely touched by his words and even a day later I begin to get a little emotional just thinking about this note. Especially considering where I was when I listened to The Winding Stairs for the first time, in the hospital room with my father the night before he passed. Again, you have no idea what your words mean, Brother. Thank You so much. I will be preaching Bro. Sepulveda’s talent every time I take this apron out and wear it. As I have stated, I have no desire to hold a chair, so every night in Lodge I will be wearing this masterpiece. In just a few nights I will be returning to a regular schedule of attendance at Lodge in a new town. I will have a piece of my father and Bro. Sepulveda with me, and I can not wait for that gavel to fall, calling the Brethren to order.